Wow, have I been making the most of my slow-cooker this season! Here on the East Coast, we have been hammered with snow, and there is nothing like coming into the kitchen after hours of shoveling or sledding to the aroma of a hearty soup or stew. My most recent concoction? 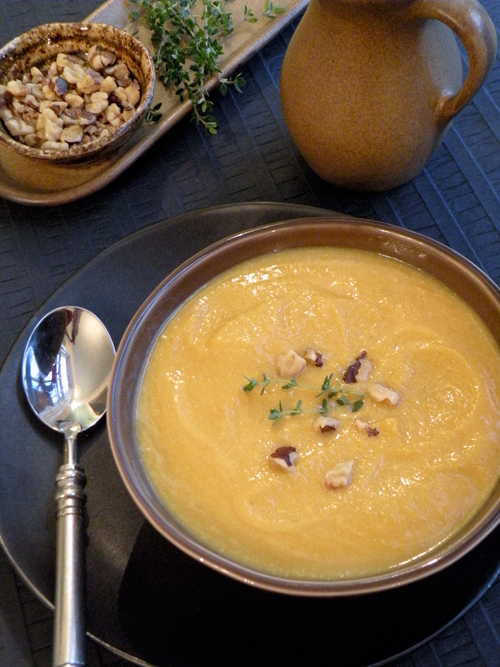 A creamy and delicious Butternut Squash Soup. I pre-roast the squash for about 15 minutes which really brings out its wonderful nutty taste. Curry and coriander add layers of flavor to the soup and are balanced by a slightly sweet touch of applesauce. Serve the soup in a huge mug and grab a warm, crusty chunk of bread and a cozy blanket. My frostbitten toes are tingling just thinking about it! – Preheat oven to 400F. Place butternut squash halves, cut side up, in roasting pan. Drizzle with olive oil. Roast 15 minutes. Cut into 1-inch cubes. – In medium saucepan, melt butter. Add onion and cook, stirring, until lightly browned. Stir in curry powder; cook 1 minute. – Place butternut squash and onion mixture into a large slow-cooker. Add remaining ingredients except heavy cream and walnuts. Cover and cook on LOW for 7 hours. – In food processor or blender, process mixture in small batches until purèed. Return to slow-cooker on WARM setting; add heavy cream and stir until heated through. – Sprinkle each serving with chopped walnuts and a sprig of fresh thyme if desired.